Welcome to Sports Fitness Solutions , we’re glad that you’ve found us. My name is Jeff Paluseo, I'm the owner and I’d like to personally invite you to come and try out our gym. We know that if you try us you will like what you find. We're so confident that you will enjoy your time with us that we are offering a 1 SESSION TRIAL PROGRAM so that you can come in and try out our gym; and see why our different approach helps all of our members get incredible results and meet their personal fitness goals. There is no long term obligation, if you're not happy with your experience there is no obligation to stay. So what do you have to lose (except for fat, inches and low self-esteem)? It doesn't matter what kind of shape you are in, if your male or female, short or tall, want to lose fat or tone up, or prepare to be the best you can in your sport, it really doesn't matter. We guarantee you’ll meet your goal. I know what you’re thinking; we’ve heard it so many times before: "I've tried everything and I'm just tired of wasting my time and money on another weight loss or fitness program." Or, "I'm exercising more than ever and I'm still not losing weight or getting in shape. Isn't there a better way to get results?" There is, the better way is Sports Fitness Solutions, where our tailored programs and professional instructors work to guarantee your success. So please come in and I promise we will get you in shape, whether your goal is fat loss, general fitness, or be the best athlete you can be in your sport, no matter your age. We can guarantee that you will hit your goals with our programs. 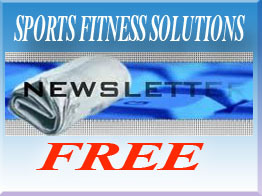 Again, welcome to Sports Fitness Solutions, we’re glad that you found us. Please look around our website; and if you have questions, please contact us. We look forward to showing you our new enlarged facility and developing a program specifically to you to help you be the best you can be. See you soon. When you come for the first time you are assessed with our Functional Movement Screen session. Your history, functional movement,physical imbalances, and goals are assessed; and from that information we create a custom program designed to help you reach your fat loss, fitness goals, or athletic goals safely. There are no "cookie cutter" programs. Each program is tailored to you and your personal fitness goals. No more endless, boring cardio routines, and frustration over spending all of that time huffing and puffing without the results to show for it. We're happy to report that we do things differently at Sports Fitness Solutions. All of our programs are scientifically programed for results. You'll also enjoy working with a team of experts who also have some pretty great personalities and bring a lot of fun to our sessions. We guarantee No boredom, only results at Sports Fitness Solutions! For years Jeff Paluseo, founder of Corpus Christi business Sports Fitness Solutions, has been dedicated to helping athletes and people of all ages and walks of life improve their fitness. Jeff has empowered his clients to perform better, recover faster and most importantly, unlock their bodies to achieve their full potential. On June 14, Paluseo will head to Tanzania Africa as part of a fundraising mission aimed at raising funds and awareness for the Villagers of Vea in Ghana. Jeff joins a team of 11 other Texas based entrepreneurs, businessmen and philanthropists with a goal of raising $100,000 to provide clean water, education, medical care and economic development for the village. Jeff is not a stranger to physical challenges. As a former professional hockey player with the Corpus Christi IceRays Jeff experienced physical challenges on and off the ice each day; and today as owner of Sports Fitness Solutions he faces daily the challenge of keeping himself and his clients as fit as possible so they can meet the physical challenges of their daily lives. Donations for the group’s fundraising can be made through the ChangeGhana.org website through June 17, 2013. All contributions are tax deductible and 100% of funds raised go directly to the village projects. About Sports Fitness Solutions: Sports Fitness Solutions is a personal fitness business and training center in Corpus Christi; and is dedicated to helping athletes and people of all ages and walks of life, attain their personal fitness goals. Sports Fitness Solutions is dedicated to helping their clients: lose fat, get fit, and feel great. For more information, please visit: www.sports-fitness-solutions.com call 774-269-3751.
devoted followers, Real Life are committed to people, not program. For more information, visit www.myreallife.org.